Glaciar Steffen is the south flowing glacier from the 4000 square kilometer Northern Patagonia Icefield (NPI). Several key research papers have reported on the spectacular retreat of this glacier in recent years. Here we report those result and examine Landsat and Google Earth imagery to fully illustrate the changes. 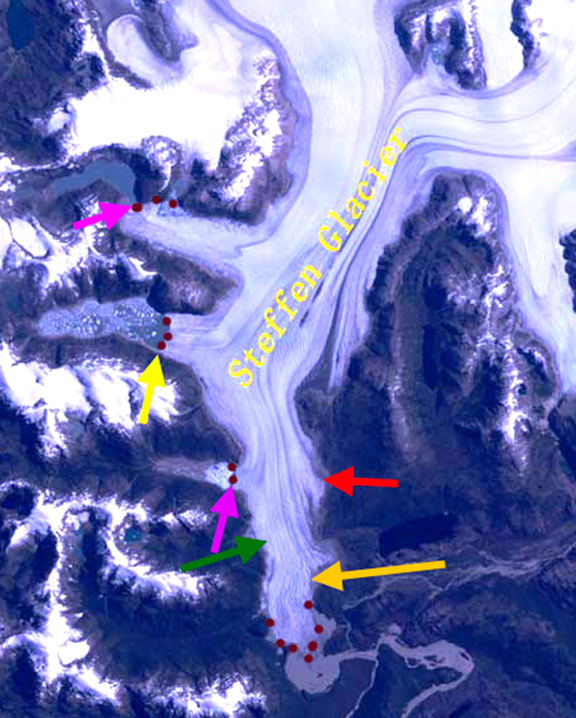 A JAXA EORC, 2011 report compared parts of the Glaciar Steffen terminus change from 1987 to 2010. They noted a retreat of approximately 2.1 km of the main stem and 870 m of a western terminus. They noted a remarkable collapse of the terminus tongue. Davies and Glasser (2012) in examining changes in Patagonian glaciers that the rate of area loss of the NPI increased dramatically after 2001, and has been 9.4 square kilometers/year. The loss of 94 square kilometers is 2.25% of the entire NPI. Rivera et al (2007) reported that Glaciar Steffen lost 12 square kilometers and had an average thinning of 1.5 m in the ablation zone from 1979-2001. In this examination we use an EROC provided image from 1987, Landsat from 1999, Google Earth 2003, Landsat 2004, Landsat 2011, Landsat 2012 and Landsat 2014. The light orange arrow is in the same location a reference point for the main terminus in each image. The terminus is indicate by burgundy dots. 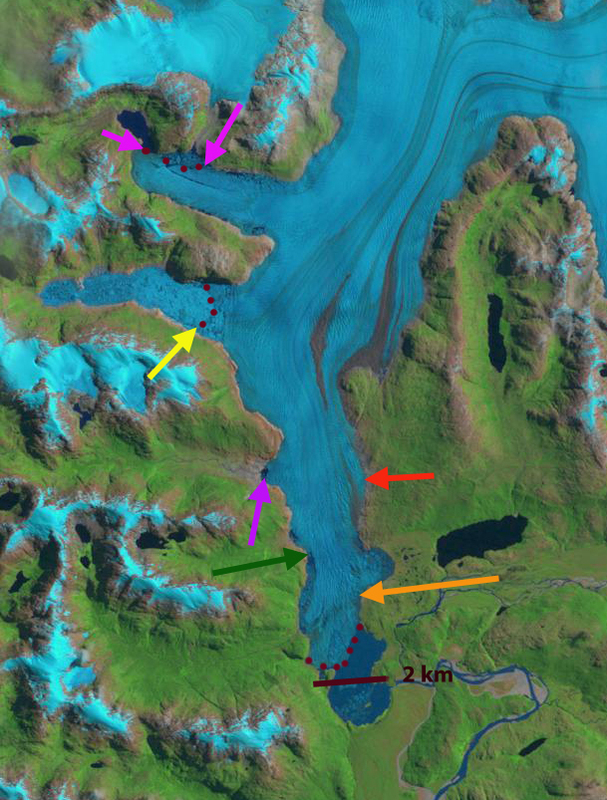 There are three lakes on the west margin of the glacier that have been fed by separate glacier tongues. From south to north they are indicated by a purple, yellow and pink arrow. 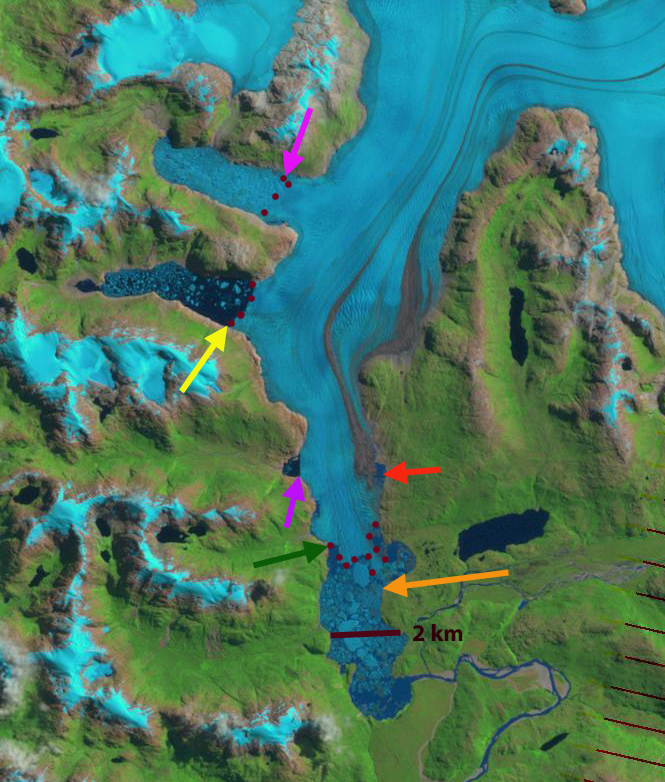 A new lake has emerged on the east side of the glacier at the orange-red arrow which is at the same location in each image. 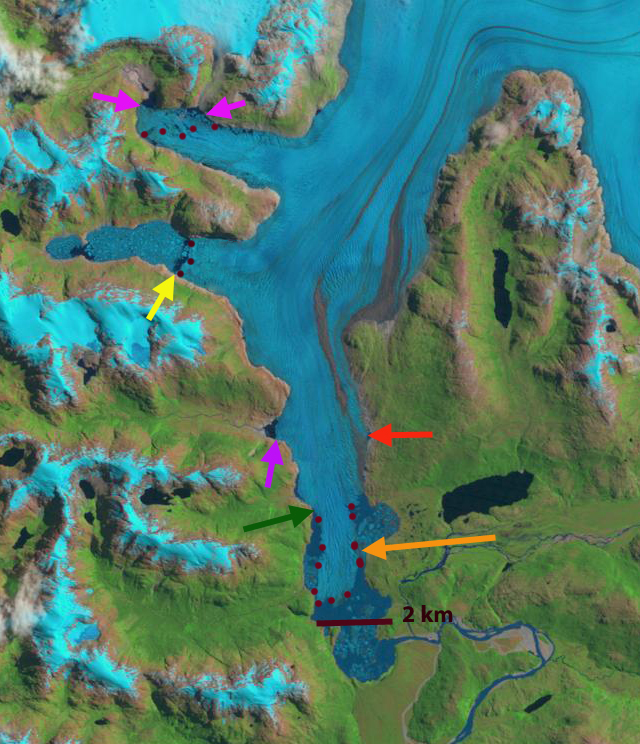 In 1987 the lake at the terminus of the glacier is 1.3 km from north to south. The NW most terminus is 4 km from the main trunk of Steffen. The middle west terminus, yellow arrow extends 1.7 km west from the main trunk. There is no lake evident at the red arrow. In 1999 the northwest terminus has retreated little but is showing signs of breakup. The middle west terminus, yellow arrow, has retreated to within a half kilometer of the main trunk by 1999. The main terminus has retreated little sinc 1987 on the west side but has retreated 700 meters on the east side. In 2003 the northwest terminus has begun a retreat exposing a new section of lake. The middle terminus cannot be discerned. 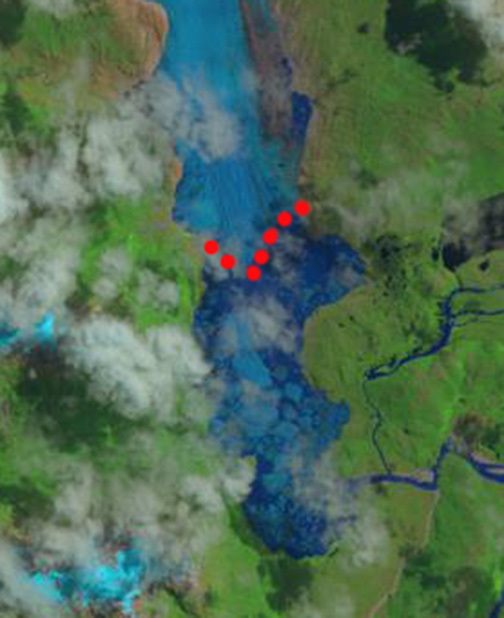 The main terminus is now an isolated tongue in the midst of the terminus lake, with open water along the east and west margins. In 2004 the northwest terminus has changed little from 2003. The middle terminus is evident from a shadow that can only come from the calving front cliff, it appears advanced somewhat from 1999. By 2011 the main terminus tongue from 2003 and 2004 is gone, the terminus has retreated north of the orange arrow. A new lake is evident on the east side at the red arrow. 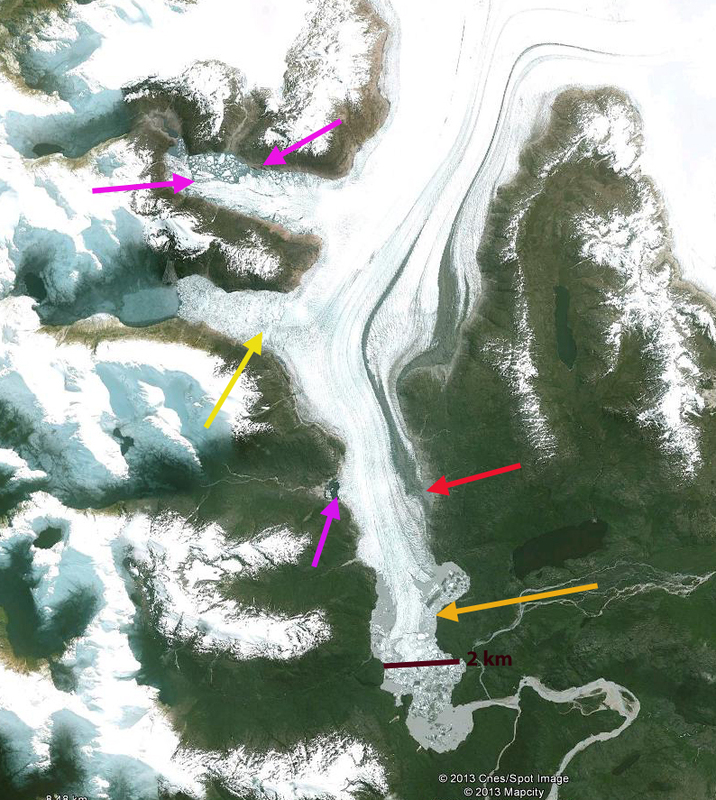 The middle west terminus has retreated back to the main glacier. 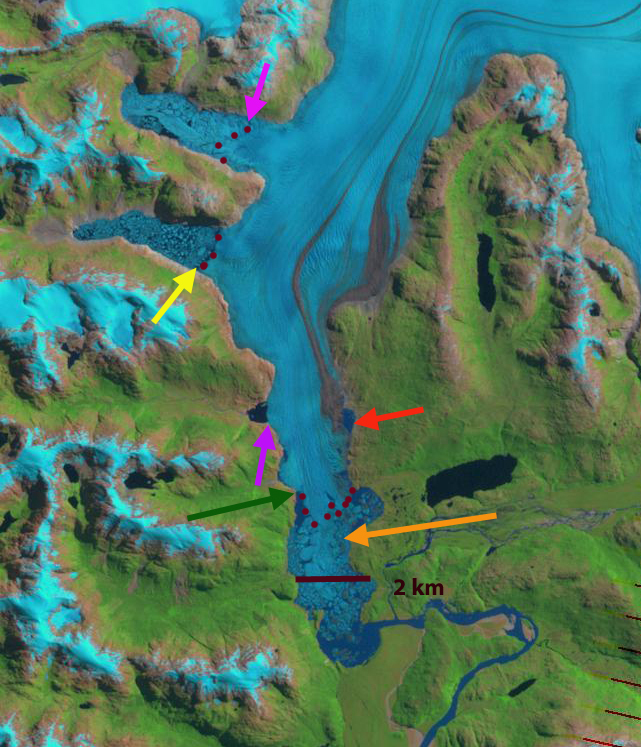 In 2012 the main terminus has retreated 3.4 km from 1987, there are small lakes on either side of the glacier above the terminus indicating that the lower 2 km of the glacier is still likely to be lost soon, back to the red and pink arrows. Modest retreat has occurred by 2014 but is difficult to quantify in the cloudy image. 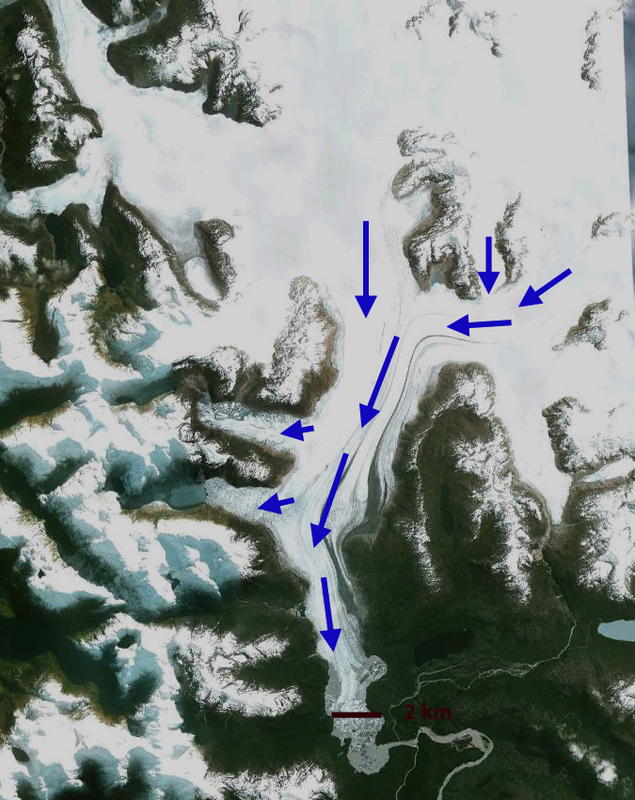 The northwest and middle west terminus are both nearly back to the main glacier having retreated 3.8 km and 1.3 km respectively since 1987. This retreat includes that of , Gualas GlacierReichert Glacier, Nef Glacier, and Colonia Glacier. This entry was posted in Glacier Observations and tagged chile glacier retreat, Glaciar steffen, Northern patagonian icefield retreat. Bookmark the permalink.